Some 13 miles south of the capital city of Seoul, Korea, is the place where Galaxy series are developed and tested, the first designs for Samsung’s Curved UHD TVs were sketched, and many other cool gadgets are still yet to be conceptualized. It is not really a city. 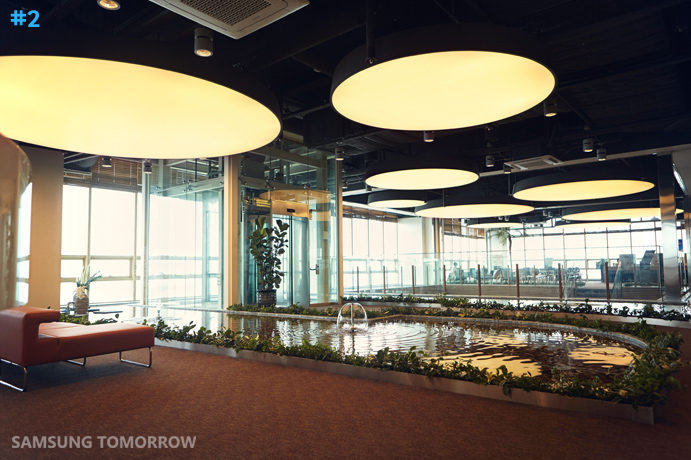 It is actually one of Samsung’s campuses where many of the brightest minds from around the world come to work. For some reason, the ‘how and whereabouts’ of these talents and this place have been kept relatively on the down low… until now. Here are 20 purposely-leaked (?!) things we want to share about the Samsung Digital City. 1. “Samsung Digital City” might as well be a city. Within 390 acres of office space, there are almost 35,000 Samsung employees, 4 landmark office towers, up to 38 floors high, 131 smaller buildings with more labs, offices, recreational facilities, and a guesthouse for visiting researchers. 2. 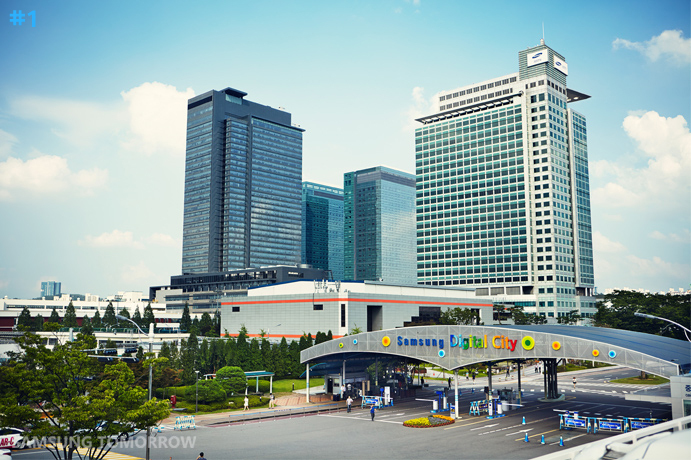 Healthcare service is free at Samsung Digital City, with numerous medical facilities that offer everything from physicals and flu shots, to dental treatments and traditional acupuncture. 3. This is not the Holodeck of the Starship Enterprise, but a MIMO (Multiple Input Multiple Output) chamber where Galaxy phones are tested…. Or is it? 4. “Get on the chopper.” Samsung Digital City has its own heliport and helicopter, ready to shuttle. No Joke. 5. …Or you can take the shuttle – Samsung has 500 shuttle buses that go to 103 destinations. 6. 35,000 people mean plenty of children. At Samsung Digital City, more than 150 teachers look after 900 children to support working parents. 9. This campus has ten basketball courts, four badminton courts, three soccer fields, and two baseball diamonds. 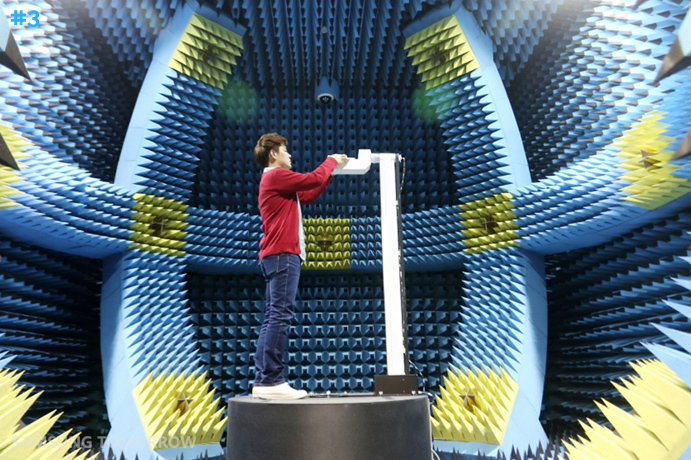 10 In this Anechoic Chamber, all sound and electromagnetic radiation is eliminated to create the perfect conditions for testing the audio performance of smartphones. 11. Without history, the future does not exist. There is a museum in the Samsung Digital City, called Samsung Innovation Museum, that showcases the evolution of the electronics industry around the world with many original devices over the past 270 years. 12. 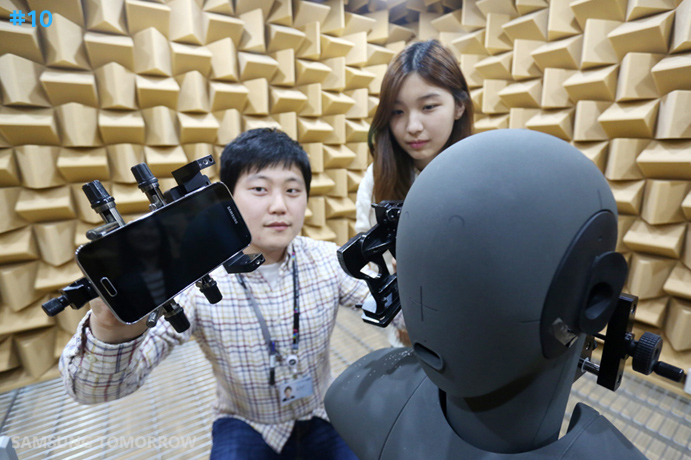 Some 69,000 people work in R&D at Samsung Electronics, about a quarter of the total number of employees. Many are based here in Samsung Digital City. 13. While it may look like he is having fun ‘slapping the bass’, this is strictly for business. This is the Sound Lab, where Samsung sound designers create ringtones and alerts for devices utilizing the broad range of recording technologies available. 14. When it’s Family Day in Samsung Digital City, the whole campus turns into a theme park for Samsung families and residents. And yes, it includes the Go-karts. 15. Every day, Samsung Digital City serves up 72,000 meals free. Whether it’s breakfast, lunch or dinner, the food courts offer 92 different menus. 16. There’s a persistent rumor that it’s also being used to test water resistance in mobile devices here at Olympic-sized swimming pool. But that usually happens in the labs around the corner, this is for swimming classes, which are offered throughout the day. 17. When it rains, it means 9,000 company-provided umbrellas – available for free use within the Samsung Digital City – are moving between buildings. 18. It is show time all the time! Whether it’s a string quartet, a rock concert, or a celebrity talk show, something is happening somewhere all the time in the open spaces across Samsung Digital City. 19. There are more than 650 employee clubs – including some more adventurous pursuits like photography and paragliding. 20. That is it. It’s time to take a break, Samsung style. Across the campus, there are areas for staff to chat, rest, relax, and even sleep. For expecting mothers there are dedicated relaxation rooms to take some time out. That is it, for now, for the 20 facts about the Samsung Digital City. What do you think about the place? Does it feel like a place that you would want to work at? Leave us a comment below!